When Apple unveiled the new iPhone XR at its Gather Round event in Cupertino Wednesday, one aspect of the phone's specs stood out. Phil Schiller said on stage that the XR will get 1.5 hours more of battery life than the iPhone 8 Plus. This would make it longest-lasting iPhone ever. 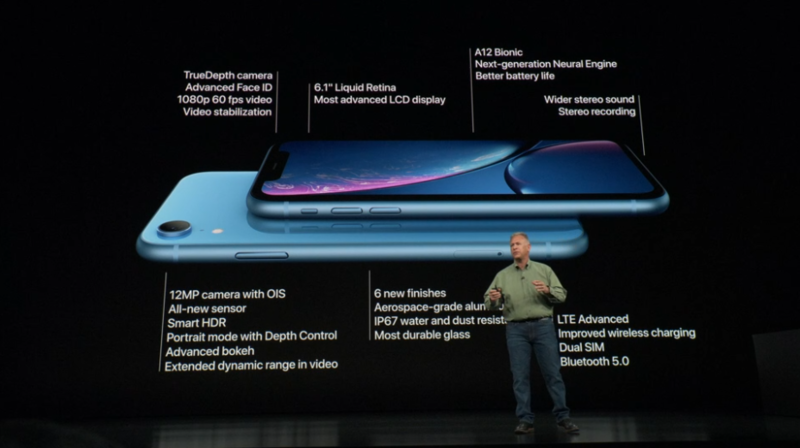 The iPhone XR's specs list talk time of up to 25 hours, Internet use up to 15 hours, video playback (wireless) of up to 16 hours, and audio playback (wireless) of up to 65 hours. In comparison, the iPhone XS claims talk time of up to 20 hours and Internet use of up to 12, while the iPhone XS Max claims 25 hours of talk time but only 13 hours of Internet time. Those numbers, however, dwarf the specs listed for older iPhones. Apple has claimed a lot of different battery life numbers at launch for iPhones over the course of the product's history. Of course, battery life at launch and a year or two later is often very different, and can also fluctuate wildly from iPhone to iPhone. When the original iPhone launched in 2007, Apple claimed "8 hours of talk time, 6 hours of Internet use, 7 hours of video playback or 24 hours of audio playback." This came in a June 2007 press release that said the device would offer "significantly longer battery life when it ships on June 29 than was originally estimated when iPhone was unveiled in January." The iPhone 3G, the following year, actually downgraded the advertised battery life. "iPhone 3G offers up to 5 hours of talk time on 3G, 10 hours of talk time on 2G,1 5 hours of Internet use on 3G2, 6 hours of Internet use on Wi-Fi,7 hours of video playback, 24 hours of audio playback on a full charge at original capacity," the company said in a press release in June 2008. The decline in battery life was part of the price to pay for the upgrade in connectivity. The iPhone 3GS in 2009 touted "longer battery life." Its specs listed up to 5 hours on 3G but up to 12 hours on 2G. For Internet use, the iPhone 3GS battery offered 5 hours on 3G but 9 hours on Wi-Fi. The iPhone 4, which arrived in 2010, also touted "long battery life," while also including a disclaimer that "battery life depends on device settings, usage and other factors. Actual results vary." The device's official specs claimed up to 7 hours of talk time on 3G, a number that doubled to 14 on 2G for the GSM model. That device offered 6 hours of battery life for Internet use on 3G and 10 hours on Wi-Fi, with 10 hours of video playback and 40 hours of audio playback. Apple's iPhone 4S, in 2011, touted up to 8 hours of talk time on 3G and up to 14 hours on 2G, while offering up to 6 hours of Internet use on 3G and up to 9 hours on Wi-Fi. The playback times, like its predecessor, were up to 10 hours for video and 40 for audio. The following year, the iPhone 5 kept the advertised talk time to 8 hours on 3G, while upgrading Internet use to 8 hours on both 3G and LTE but up to 10 hours on Wi-Fi. The playback times, once again, remained at up to 10 and 40 hours for video and audio. The iPhone 5S, in 2013, saw an upgrade of up to 10 hours of talk time on 3G, although Internet use remained 8 hours on 3G, moving up to 10 hours each for LTE and Wi-Fi. Video and audio playback remained up to 10 and 40 hours, respectively. Meanwhile, the 5C, also that year, listed up to 10 hours of talk time on 3G, 8 hours of Internet use on 3G that upgraded to 10 each on LTE and Wi-Fi, and video and audio playback that remained at up to 10 and 40 hours. The iPhone 6, which arrived in 2014, saw a big jump to up to 14 hours of 3G talk time. Internet use was up to 10 hours on 3G, up to 10 hours on LTE, up to 11 hours on WiFi. Video playback was listed as up to 11 hours, with audio playback of up to 50 hours. But, the 6 Plus, released that same fall, reached a new level, advertising up to 24 hours on 3G, with Internet use reaching up to 12 hours for 3G, LTE and Wi-Fi. Apple advertised up to 14 hours for HD video playback and audio playback of up to 80 hours. When Apple released the iPhone 6S and iPhone 6S Plus in the fall of 2015, it didn't adjust the talk time, once again offering up to 14 hours of 3G talk time for the smaller model and up to 24 hours of 3G talk time for the larger one. Internet use numbers also stayed the same. In late 2017, Apple issued a statement about worn batteries in some older models, including iPhone 6, iPhone 6s and iPhone SE, leading to unexpected shutdowns. They claimed they had solved the problem iOS 10.2.1 a year earlier, but some problems persisted, leading Apple to reduce the price of out-of-warranty iPhone battery replacement to $29, and launched another iOS software update. Apple would have to admit later that that iOS 10.2.1 update had temporarily throttled iPhones with depleted battery cells. In 2016, when it released the iPhone 7, Apple claimed it "lasts up to 2 hours longer than iPhone 6s," while the concurrent iPhone 7 Plus "lasts up to 1 hour longer than iPhone 6s Plus." The iPhone 7 listed talk time on 3G of up to 14 hours and the 7 Plus touting up to 21 hours on 3G. The 7 offered up to 12 hours of Internet use on 3G and LTE, and up to 14 on Wi-Fi, while the 7 Plus upped those numbers to 13, 13, and 15. The iPhone SE, released at the same time, offered 14 hours of talk time on 3G, up to 12 hours of Internet use on 3G and 14 each on LTE and Wi-Fi. It offered up to 13 hours of video playbook and 50 hours of audio playback. When the 2017 models arrived, Apple touted the battery life in the iPhone 8 and 8 Plus as "about the same" as the 7 and 7 Plus. But the iPhone X advertised its battery as lasting "up to 2 hours longer than iPhone 7." This meant talk time of up to 21 hours, Internet use of up to 12 hours, and video and audio playback of up to 13 and 60 hours, respectively. Battery life, once again, doesn't necessarily always live up to its promise, especially as a device gets older. While battery life has sometimes taken a backseat to other aesthetic and functional considerations throughout Apple's history, it is certainly something that's important to customers on a day to day basis. And, it's also something that, slowly, Apple has found a way to improve over time. That’s a very interesting consideration for buyers. Battery life may be far more important to some people. 2X optical + 6X digital vs 0X optical + 2X digital? That's more than "slightly better" when it comes to the camera system. You also have the dual-sim capability + HDR capable display + extra RAM + gigabit LTE. 3D Touch, at least generally to my knowledge, is not used by most iPhone users. I think the only time I use it is when I want to choose how bright I want the torch to be, but your milage may vary of course. The extra ram has not yet been confirmed, has it? But even so it is likely to be a negligible hit to the performance. IP68, definitely a plus, but I can't think of many scenarios where this will really make a difference. Dropping it in the pool, down the toilet, in a fishing lake etc and you're all good to go with either handset. Optical Zoom, yes I can see why you'd want that if you use the phone in a semi-professional capacity. But for most people who just want to take holiday snaps pics of the kids, you'll not notice a difference. **Update, there is a difference in the Ram, 3GB vs 4GB, but benchmarks seem to indicate a very small increase in performance overall, generally unnoticeable. I forgot dual SIM in the Xs. This is a huge problem. The average consumer isn't gonna be tempted to spend more because they won't know any differences. Heck more will prefer the colorful look even after entering the Store to buy an XS. I'm getting mixed messages on dual sim, some sites indicate that it is present in the Xr. Those Android slaves won't bbe able to mock us for short battery life, not anymore! They used to claim iPhone users had to camp out near wall outlets. Now they look like the fools that they are for doing that. I was in the same camp when the iphone was launched. But I think other than the screen the camera is a big downgrade from the iPhone 8+ that I currently have. The zoom alone probably matters most to anyone who only uses iPhone for all kinds of photography. It is present in the XR. Double lens with double optical image stabilization is significantly better camera system not slightly better. iPhone XR is designed specifically to bring good value and to amount for the bunk of iPhone sales. I have no doubts that the iPhone XR was designed to be the "meat" while the XS was designed to be the "fat"
I don’t feel as though Apple lied or I was mislead I just pointed out something that has taken the XR out of consideration for me.